Laurence Holder’s biographical drama about Malcolm X is the inaugural production of the Brixton Empire. Daljinder Singh’s new venue is better known to ravers as the nightclub Mass. Though it can’t conceal its dual purpose, it offers a decent-sized flexible hall, set up here in traverse. 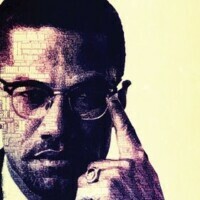 Blending fact with fiction like Peter Morgan (Frost/Nixon), When the Chickens… charts Malcolm X’s relationship with Elijah Muhammad and the Nation of Islam, from his conversion in prison to his assassination by members of the organisation in 1965. Holder glosses over more unsavoury beliefs to suggest a righteous, media-savvy moderniser scuppered by commitment to his cause. Beneath the outward civility, there’s a nuanced and tactical power struggle. However, while Holder’s dialogue is absolutely believable, he sacrifices context for realism, never providing a crucial leg-up for those new to the subject. Singh’s production, dark and dreamy thanks to Azusa Ono’s minimal lighting, boasts fantastic performances from an enigmatic Ricky Fearon as Malcolm X and Peter Landi as Muhammad.